AMAZING! Awesome little slice of paradise on a beautiful beach. Lots of hammocks and chill out spots to hide from the sun for a little bit. Great pool table, ping pong table, cheap bar which was great! Rooms were great, good AC and comfy beds. Bathrooms were clean and ample. Staff were very helpful and always had a smile. Would stay here again in a heartbeat! The hostel is just alongside the beach. The view of the beach, the staff, the location and the facilities, all of it makes the stay worthy. Absolute paradise. Best hostel I’ve ever stayed at. Do not miss this place!! Staff, facilities and location are all perfect. Cannot recommend this place enough. 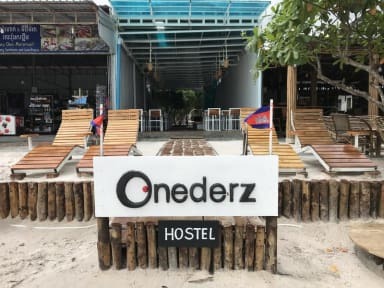 We loved staying at onederz. Each bed has its own curtain and fan and the beds were comfy. I also liked that the top bunk wasn’t too high up. Staff were super helpful with everything we asked and everywhere was being cleaned constantly. Probably the best hostel I’ve stayed in in south east Asia so far! Lockers in dorms too cramped together meaning everyone puts them on the floor not ideal when rooms are small or when boys forget where the toilet is and wee on peoples bags!!! New Bar is good but music being on till 1am is very annoying when your room is directly opposite. Door of our dorm didn’t shut properly or lock so everyone people come in and out they have to slam it, very annoying if your sleeping when others come in. Showers and toilets great and always kept clean. The location was perfect, right on the beach and it had sun loungers. The garden/bar area was great. There were hammocks and swinging chairs dotted around everywhere with the bar in the middle. The room was pretty small and smelt like pee and damp most of the time. The air con was really good and each bed had its own fan which is handy when the aircon is off during the day. No hot water in the showers and some of them were clogged up with hair. Would definitely stay here again though. Amazing location and just an all round wonderful hostel! Lots of chilled areas out the back with hammocks, pool table and bar, plus the beach front with chairs for sunbathing. I extended my stay to five nights and had a really lovely time. Quite chilled though so if you want to crazy party this isn’t the place to go. Great place to stay - very much chilled beach vibes and has a good kitchen if you want to eat in. 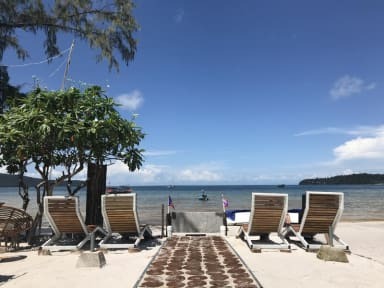 Pretty decent hostel on Koh Rong Samloem. Food was delicious and good value (get the Amok). Lack of air con in rooms between 9am and 9pm is a bit of a pain, especially as it's so hot in the rooms otherwise, but at least it's there. Restaurant area was nice and cool when the fans were on. Dorm floor got a bit dirty from people walking in with wet feet, and beds weren't the greatest (privacy curtain only covered half the bed...!?) Great social/ lounging areas; superb location on Saracen Bay.